I am still flying high from the dancing at Chabad Israel Center in New York City on Simchat Torah! This past Saturday in Israel and around the Jewish world the festival of Simchat Torah took place. Simchat Torah “Rejoicing in the Torah”, celebrates the conclusion of the annual cycle of the public weekly reading from the Torah. Each week, a different portion (Parsha) of the Torah and the Prophets are publicly read in the synagogue, starting with Genesis Chapter 1 and working our way to Deuteronomy 34. On Simchat Torah, we read the last Torah portion (Parsha), then immediately proceeded to the first chapter of Genesis, taking the Torah a full circle, a circle that never ends. 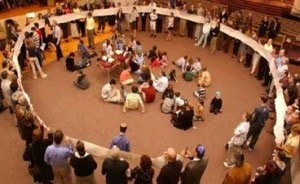 This completion of the reading of the Torah is a time of great celebration in synagogues all over the world. In most synagogues, the Torah is removed from the ark and carried around with plenty of singing and dancing. Drinking is very common during the procession; in fact, it is traditional for the priestly blessing to be performed early in the service to make sure that the Kohanim (priests, a descendant of Aaron, in charge of the rites in the temple; not the same as a Rabbi) are not drunk at the time of the blessing. As many people as possible are called up for an “aliyah” (reciting a blessing over the Torah reading) which is considered an honor. In addition, people are given the honor of carrying a Torah scroll in the procession. Children do not carry the scrolls because they are too heavy, but often follow the procession carrying small paper Torah scrolls. In some synagogues, ceremonies marking the beginning of a child’s Jewish education are held at this time. Hy Becky, thank you very much for your comment. Congratulations on your Hebrew lessons. In my opinion Hebrew is a difficult language for English speakers, especially if they speak only English. Did you get to the "Nikkud" portion yet? Learning Hebrew, there are a series of dots and dashes, under, above or inside the letter. These dots are called nikkud; most nikkud indicate vowels. 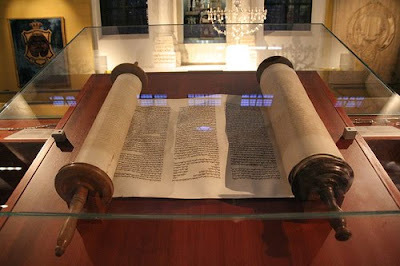 Then there are different script for sacred writing such as the Torah scrolls,or the scrolls inside tefillin or mezuzot. This style is referred to as Sefrei Torah. The Hebrew alphabet that is used today is referred to as the Assyrian Script. People who are fluent in the language do not need the nikkud to read Hebrew and most things written in Hebrew in Israel are written without nikkud. Good luck on learning Hebrew, I'm still not fluent yet.